Last night, we discussed whether to bail on day two, mostly due to heat. This morning we decided to go for it. The forecast was a bit cooler, but more importantly, the route was shorter, with less overall climbing, and more descending to break up the climbs. We manage to pack the car and check out of the hotel and still get rolling as about the same time as yesterday, which was a major achievement in itself. Today’s ride had a short climb at the beginning, then a nice long descent. The rest of the ride would be climbing to make up for that early fun. It started off pretty well, with nice rolling hills. We spent some time on larger highways, which was somewhat less fun. For most of it, there were large enough shoulders, although with varying condition. Descending Highway 49 was kind of exciting. There was no shoulder, so we took the lane. There was a stream of cars behind us, who wanted to pass. We were going 30, though, so it wasn’t easy for them. It was only a mile or so before we turned, at Drytown. That’s when the climbing got a lot tougher. It got pretty steep, and the heat was building. We spent some time walking, and some riding. We eventually got to another descending bit, which was quite nice. We passed a 12 year old girl riding a horse down the street, before it was time to go back up. At the top, there was an abandoned mine shaft, complete with the structure for the elevator. 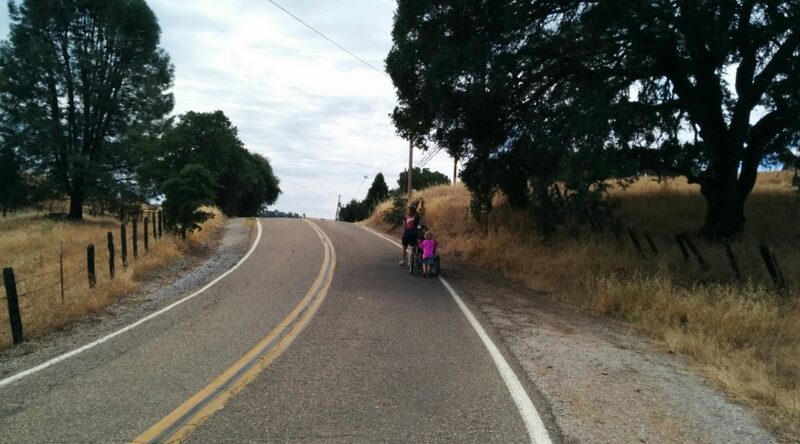 We rode along the ridge line, then descended into Amador City. Once through the small town, we started working on the final climb. Once again, it was rough. As we got closer to the top, I could tell Anne was really struggling. I asked Ruth if she wanted to walk with us, then Anne could push my bike (with an empty trailer), and I would take hers (with Max). Ruth was excited to be walking, and after a bit asked if she could help. Anne had her push on the trailer, which supercharged things. They got to the top, them Ruth came back to help me. It was amazing. I suspect the novelty would wear off, but it’s definitely the way to go. Then it was just a quick descent back into Sutter Creek, an intense right turn, and we were back at the hotel parking lot. After we repacked the car and changed, we headed to downtown for some ice cream, and played in the playground at bit before driving home. The kids were really good today. Ruth was much more moderate with her requests, and stayed excited and pleasant all day. She even helped me woohoo on the descents. Max was happy in the trailer, and got at least one good nap in. On the ride home, Ruth asked when we’d next go for a big bike ride. I take that as a goo sign. Day one of our first overnight bike trip with two kids is behind us. We figured we should take it a little easy, so we’re doing it as two ~25 mile loops. That means we don’t need to carry much luggage with us on the ride. To make the weight more manageable, Ruth and Max are each in their own trailers. I’m pulling Ruth in the single, and Anne is pulling Max in the double. I would have thought Ruth would like the room in the double, but she insists on the single. Yesterday we arrived at the Days Inn in Sutter Creek. It’s just a couple of blocks from the downtown, which mostly seems to be buildings from the gold rush era. Today we headed up the hill, with a rolling but overall fairly gentle climb towards Volcano, an even smaller gold rush era village. After stopping to refill water and buy sandwiches for lunch, we got going for the big climb of the day. The climb up Rams Grade is about 6-7% over 3 miles. We’re pretty out of shape, and it’s hot. Anne stopped a couple of times, which I was happy enough about. It gave me a chance to rest and drink some water, too. We stopped for lunch near the top. There was a bench at the entrance to some ranch. We made a wall with the bikes, and the kids kept probing it for weaknesses. We finally made it to the top, and enjoyed a really nice descent. There were weird pockets of hot air that we went through, almost the opposite of a nice cool breeze. There were also a few more short climbs, although by that point, even short was more than we really wanted. Finally, we rolled back towards town. We came through a much newer section, with more modern tract housing. After a quick stop at the hotel, we walked to get ice cream, then pizza for dinner. We saw quite a bit of wildlife today. Anne saw a deer hop down an 8 foot cliff, them across the road to go further down the hill, but I missed it. For a bit, a wild turkey paced us. We even saw a fox, which I think might be a biking first for us. The kids behaved pretty well, overall. Ruth was whinier than usual, but I think we got some improvement by the end (“try again, but ask nicely this time “). When we got back to the room, she announced that she had the best day ever. I guess we did something right. Max managed to separate the shell of his helmet from the plastic framing, twice, which upset him. 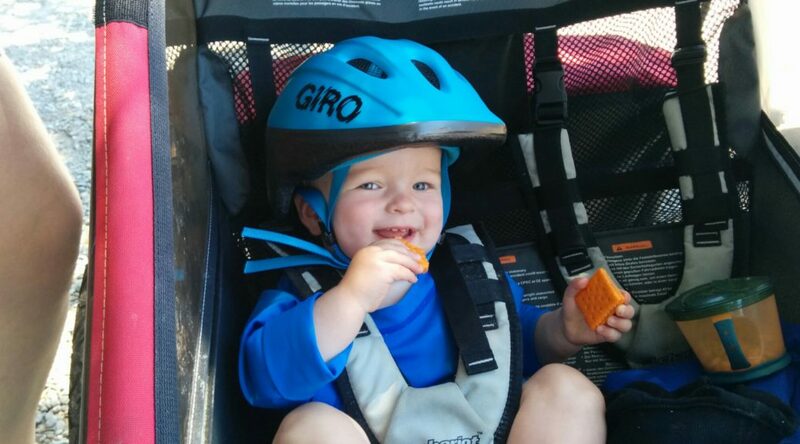 We gave up on the helmet for the day, and then he was happy. He was pretty excited to explore whenever we took him out of the trailer, but was also content to go back in. He got a good morning nap, and was working on an afternoon one when we got back. We’ll need to figure out what to do about the helmet. It was very hot. We tried to get an early start to beat the heat, and partially succeeded with an 8:22 rollout time. It was still 92 by the time we got back to the hotel, however. Tomorrow we’ll need to pack up the room and check-out before we leave, so hopefully we’ll still be able to beat at least some of the heat. 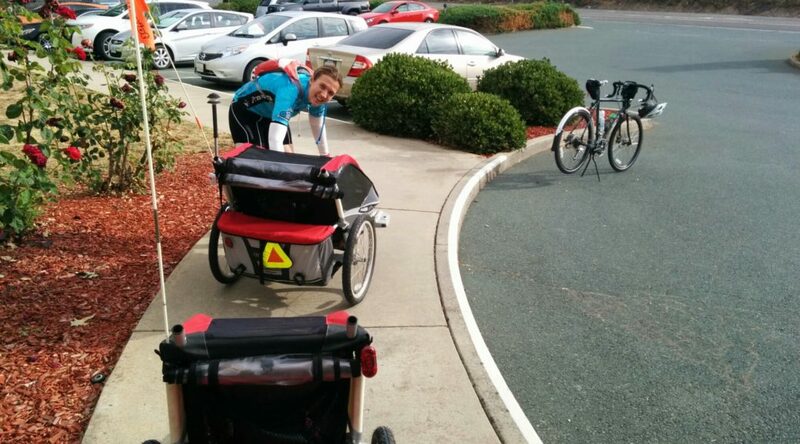 This week we tried putting the kids in separate trailers. It worked out well. They both were pretty happy for the entire ride, and it’s a lot easier to pull just one. This ride has some moderate climbs, which I think we’re both out of shape for. It was still pretty good though.